Lt. Col. A.T. Ballard, Jr. USAF (Ret. 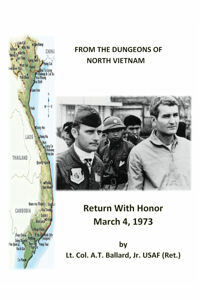 )’s “From the Dungeons of North Vietnam: Return with Honor March 4, 1973.” Lt. Colonel Ballard, a USAF jet pilot, was shot down, captured by North Vietnamese soldiers and interred as a prisoner of war in 1966. He endured six and a half years of pain, hunger, thirst, fear, anxiety, humiliation, and degradation. This memoir vividly chronicles Ballard’s capture, torture, and the living conditions that he and his fellow POWs endured until their release in March of 1973.